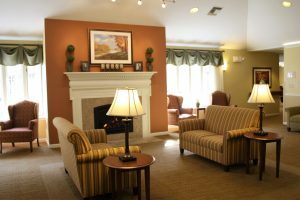 Textiles for senior living have come a long way since I started my interior design career. I remember coming across chairs upholstered in the first iteration of Crypton fabrics during my site visits. These ‘fabrics’ were more like printed vinyls, in all shades of rose, blue, and seafoam green. They reminded me of furniture upholstered in vinyl tablecloths! And sadly, dementia-friendly fabrics made up an even smaller subset that only consisted of solid colors. Starting in the early 2000’s, textile companies finally understood that they needed to create fabrics for healthcare applications and senior living that could not only withstand bodily fluids and the subsequent cleaning, but that also looked like regular fabrics. Not shiny, not crunchy, and not scratchy. 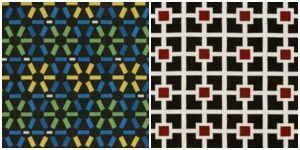 Adding to that, the textile companies began to design fabrics that had a wide variety of patterns ranging from bold hospitality patterns to versatile solids. There are a couple points to address with contrast. First, the contrast of colors in the actual pattern. You typically do not want any patterns with high contrast, and especially not with very dark colors on a light background or vice-versa. For example, I’ve seen instances where there were small black dots in a pattern, and residents picked at the dots or thought they were little bugs. Second, the fabric(s) on an upholstered piece should contrast the flooring and the wall (if it is near/up against one). Think about when you are looking for somewhere to sit. First, you need to locate a chair in the room. Then once you find one, you need to be able to see where the seat starts and ends when you start to lower yourself. So, for example, you would not want to use a brown vinyl on a chair seat in a dining room with wood-look flooring of the same tone. Crypton is one of the main textile manufacturers used in dementia communities. 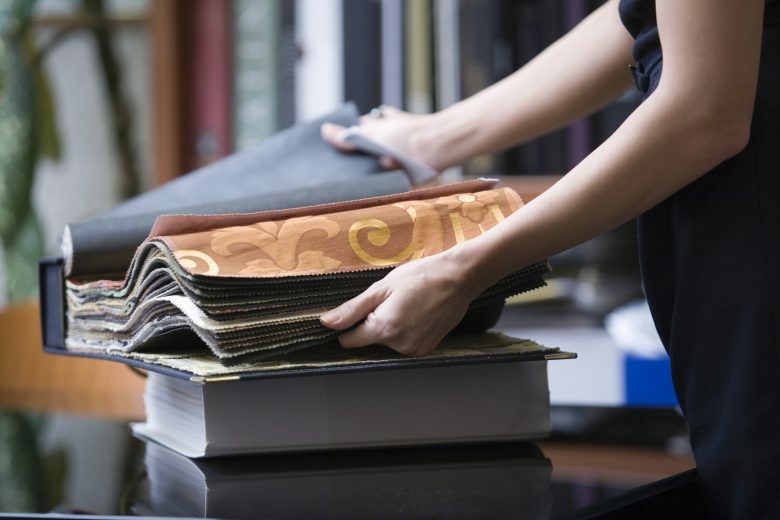 Put simply, Crypton has cleanability and moisture resistance engineered right into the fabric. You will see videos where liquid beads up on a Crypton fabric when spilled on it. If you catch the liquid right away, it will wipe clean fairly easily. However, eventually it will start to absorb into the fabric and it will be more difficult to remove the liquid. This happens a lot with incontinence accidents where the resident is sitting on the chair, or the accident isn’t discovered right away. In these cases, using Crypton’s cleaning process is necessary. Patterns should not be too busy or have too much movement. Often geometric patterns with high repeats and contrast can be disorienting or cause agitation (as shown, left). I’m sure we’ve all seen a pattern where we say, “That pattern makes me dizzy!” Such patterns should never be used in memory care. As seniors age, their vision begins to take on a yellow tone and colors lose their intensity. It is important to use vibrant colors so that residents can see the more saturated colors. Pastels can appear gray and should be avoided as a color palette or main color scheme. I also advise against using light colored fabrics on seats (excluding vinyls). Although fabrics like Cryptons are made to repell stains, they still get dirty, and light-colored fabrics look dirty much faster than darker colors. I have read different points of view on patterns. In my experience, sticking to low-contrast patterns in textures or organic stylings has been successful. 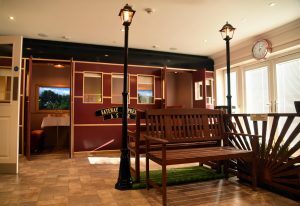 It also helps give some interest in a room when there are multiple seating arrangements, instead of everything being solid. 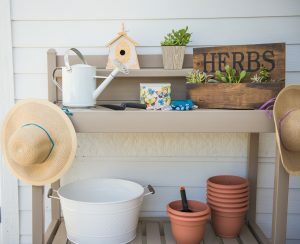 However, some claim that residents with dementia will think floral or leafy patterns are moving and should be avoided. My experience is that if the contrast is low, the pattern shouldn’t move. I’ve used lots of nature-inspired patterns in low contrasts and have had no issues, but that doesn’t mean that some resident somewhere might have an issue with it. It is the nature of this area of design that we have to ride the line of making comfortable, beautiful spaces and making sure the materials will not cause issue with any residents. 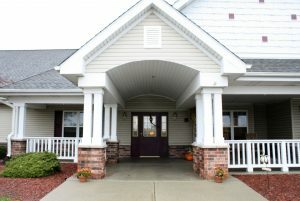 Rachael’s comments: Everyone in senior housing needs to read Amanda’s article! 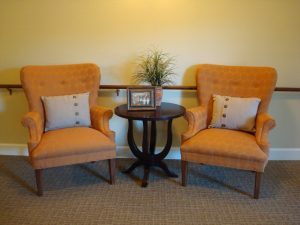 I go into a lot of senior living communities, and I still sometimes see those vinyl-like chairs that she was talking about. I’ve also seen chairs that literally have plastic on them. Whose house has comfy, plastic-covered furniture? Dementia care communities, in particular, have extremely particular needs when it comes to fabrics and patterns. Amanda hits the nail on the head here.